I’ve watched Iron Man 3 many times by now and I still really love it. I don’t know about anyone but to me, Iron Man 3 is the best Iron Man film of all three. Iron Man is the first superhero film that made me fall in love with superheroes. I knew X-Men (2000) is before Iron Man (2008), but I didn’t really know about Marvel back then, so I haven’t watched any X-Men films. I also was not interested with Spider-Man (2002) even though my father seemed to like it. Robert Downey Jr. is back as Tony Stark a.k.a. Iron Man, which is super exciting because Iron Man is my favourite superhero after all. I have never doubted Downey’s performance since the beginning. He is a great actor with great skills that the audience can love-hate his character simultaneously. I can’t lie that Iron Man franchise has made his name even widely known that he already is. He really has become a huge star because of his role as Tony Stark. I really can’t imagine if someone else took this role because I think Robert Downey Jr. is the perfect actor to play Tony Stark. You just can’t deny the fact that because of him, Iron Man has become an iconic superhero as well. Even though I like Robert Downey Jr.’s performance as Tony Stark, I don’t think I like Gwyneth Paltrow’s performance. Even though she’s good at playing Pepper Potts, I just think there’s something missing about her. I just can’t put my finger on it. However, of all three Iron Man films, this is the best performance of Gwyneth Paltrow as Pepper Potts. Although the romance between Tony Stark and Pepper Potts is not much, I still like the chemistry that Downey and Paltrow made. They may not be the most romantic couple but you can see that they actually care for each other. Don Cheadle as Colonel James Rhodes a.k.a. Iron Patriot also gave an extra entertainment in the film. His relationship with Tony Stark can eventually make the audience laugh, especially the way they interact each other. As for Ben Kingsley, well, he did play an interesting villain. I can’t expect less from Ben Kingsley for he is always good at playing his characters, including being some sort of villain the film. I think I never watched Guy Pearce’s films before but playing Aldrich Killian in the film suits him. Not that I’m saying he has evil face or sort, but he really is good at playing the antagonist of Iron Man. I am not implying anything, but he can make his face very resentful indeed. It’s a sign of a great actor when he or she can make the audience hate them. It means they played their character really well. Iron Man 3’s plot story is basically following The Avengers (2012) from the previous year. Tony Stark is more unstable because of that happened in New York during The Avengers film. We can see a more vulnerable side of this arrogant-philanthropist, which was very interesting to see, at least for me. Like always, you’ll hear many sarcastic jokes from Tony Stark that will eventually make you laugh or at least, smile. JARVIS is still the coolest computer ever. Who doesn’t want to have a technology like that, especially as good as JARVIS and as loyal as him? Eventually, JARVIS has become some sort of best friend to Tony Stark, even though he is just an Artificial Intelligence. Iron Man 3 is huge because there are so many stuff blows up. Not only that, the amount of Iron Man suits have increased like hundred times, literally. The creator of Iron Man 3 really knew how to entertain the audience. With all the explosions in the film, as well as the plot elements like the terrorist attack, internal problem, and so on, Iron Man 3 has become more complicated than the first two films. 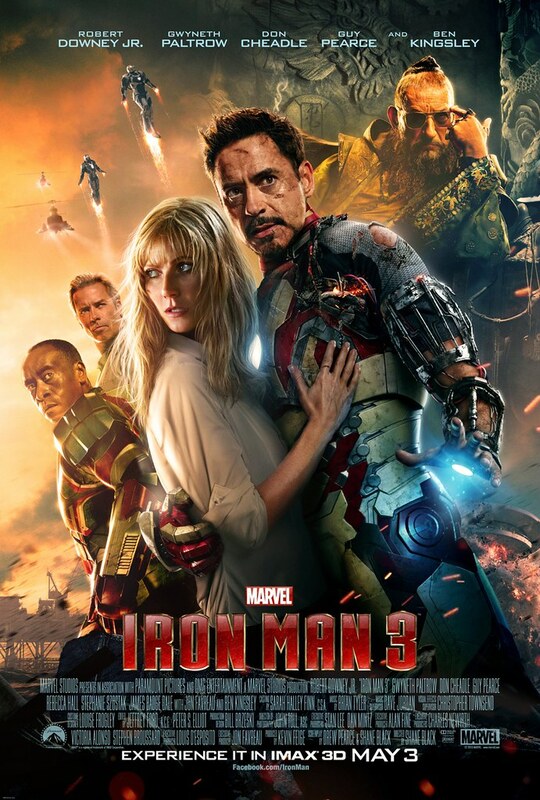 I can’t say if it’s better or worse than The Avengers, but I really enjoy Iron Man 3 very much and still think that this film is the best of all three films. The CGI effect is perfect, at least to mere eyes like mine. I don’t know if this film is the last Iron Man film ever but I sure hope not, because I really like Iron Man a lot. However, with so many superheroes out there, I think putting a stop of one franchise is not a bad thing. A too long franchise film will eventually make the audience fed up, especially when the bigger plot is basically the same. Unlike Harry Potter films that have very different plots in every film even though the final conflict is basically one and the ending of the story is exact and certain. However, I am looking forward to seeing Iron Man in another Marvel films franchise, such as The Avengers and any other Marvel films. I was so happy when Iron Man showed up in Captain America: Civil War (2016). I never like Captain America films until Iron Man showed up in its third film, which basically more like an Avenger film rather than Captain America film. I like the fact that my favourite actors start to play in Marvel films one by one, from Robert Downey Jr. in Iron Man, Hugh Jackman in X-Men franchise, to Benedict Cumberbatch in Doctor Strange (2016). And therefore, I like it better if Marvel expands the superheroes films rather than making a long story of one superhero. But then again, it’s only my personal opinion, so you may differ. All in all, Iron Man 3 is truly an entertaining film. It’s huge and massive than the first two films. The story is even more complicated with so many problems from Tony Stark’s PTSD to the terrorist attack. The action has become greater because the number of explosions in Iron Man 3 is increasing. The fighting is better with the increasing amount of Iron Man suit, especially during the final battle. I think it’s the highlight of Iron Man 3 that is memorable up until now. Surely, Iron Man 3 doesn’t fail to make me laugh many times when I watched the film. All the actors and actresses have done an excellent job in portraying their characters, by means, they really have entertained the audience from the way they brought their characters to their actions in the films. And like any other Marvel films, there is also a post-credit scene by the end of the film. So you better not to turn off the film before it ends. I give Iron Man 3 9 out of 10 stars.